22-23 February 2018. Arlington, Virginia. 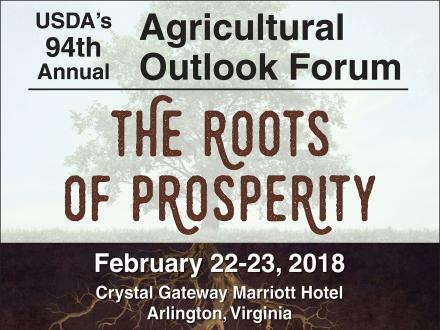 Now in its 94th year, the Agricultural Outlook Forum was the USDA’s largest annual meeting, attracting as many as 2,000 attendees from the U.S. and abroad. The forum highlighted key issues and topics within the agricultural community, offering a platform for conversation among producers, processors, policymakers, government officials, and non-governmental organizations, both foreign and domestic. Growing incomes lead to expanding food demand in SubSaharan Africa and Southeast Asia. With a combined population of almost 2 billion, these regions have a growing presence in global agricultural markets and are emerging markets for U.S. agriculture. Dialogue on demand-side changes, developing value chains, and the role of technology, discusses competition and challenges in the region. Perspectives on changing food systems, following how the diet transition to processed food spans demand side changes and developments along value chain structures. Strengthening value chains through development, how capacity building creates opportunities on the ground, and challenges to accessing local markets. Historical perspective on how technology and trade change together, linkages between productivity and ability to purchase imported commodities, and implications for the United States.